Ooooh, my first award. Thanx so much! That blanket is starting to look fabulous! That ‘Home Sweet home’ is wonderful! I love every detail! And the blanket is going to be beautiful! Thank you so much for the award. Its my first one. I really love that applique work. It will look extremely pretty when framed. 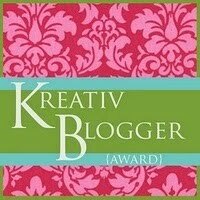 Thank you for my award !!! I answer you soon. I really love your “home sweet home” ! 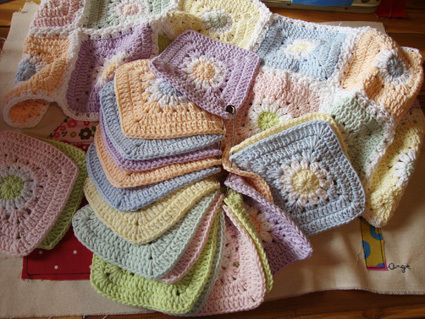 The Daisies in a square blanket is coming along beautifully. Pastels look so yummy together. I enjoyed reading your list and getting to know a bit more about you. Jeans and T’s forever! Sucrette…no need to fear death. You only need to believe in Jesus as your Savior. John 3:16 You sound like a beautiful and wonderful lady…love your colors and your happy spirit! sucrette…i was very sorry to read about your fear of death….altho it is sad to lose someone you love i always remember that my loved one is not gone, i simply cant see them anymore but i know they are always near…i look forward to death as i get older because in the bible my jesus promises me that if i am baptized and believe in him i will be together with him forever in the splendor of heaven…i was a nurse for 40 yrs until i got sick and i tended to many people as they were near death….every person i observed rested so peacefully until they took their last peaceful death…and i truly believe that at our last breath, the holy angels gently lift our souls out of our old worn out bodies and carry us off into a wonderful new existence where there is no pain or suffering, no illness or distress, where we are met by all our family who have gone to jesus before us. i cant wait to see my big family, my mom and dad and sister and grandparents again. please pray about this fear and im sure jesus will enlighten you to see things you didnt know before. he will bring you peace. Love the beautiful applique so sweet & colourful & the blanket is really looking well. 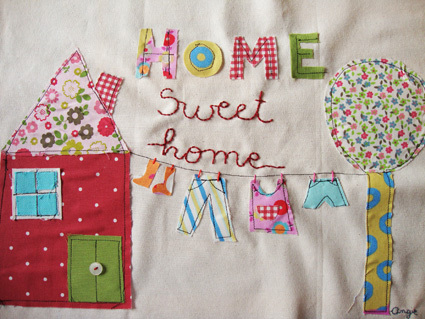 I love that “Home Sweet Home” applique. It’s gorgeous! Hi Angie, thank you so much for the award! I really do appreciate it 🙂 and I love looking at your lovely colourful blog. The Home sweet home picture is just so pretty – you’re so clever! Congrats on your award. Both of your projects are beautiful. I want you to know that you inspired me to want to learn to make granny squares. I never had the desire to crochet, but your projects are so bright and cheerful and colorful that I wanted to give it a try. My mom taught me how to make granny squares this week. I love it! Hello Angie, i would just like to know if you received my mail about this award , i send it at the begginning of june ? OK ! Have a good sunday !